I’m so excited about our new products I wanted to tell you about this one here, not just in the newsletter as usual. I have 100 pounds of pastured beef ordered and am expecting delivery any day now. I’ll be making jerky from some of the ground and at least one roast. I thought I’d share some of my favorite recipes along with this new product announcement. I use this marinade on my beef strips. You can use a tougher cut of meat thanks to the tenderizing properties of the pineapple juice. Combine all ingredients in two quart pan. Warm over medium heat, stirring until the sugar is dissolved. Allow to cool. Pour the marinade in a 9 x 13″ pan. Lay 1/4″ strips of beef, deer, moose or other large game in the marinade and allow to sit in the refrigerator at least overnight. Pat the meat dry. Follow the dehydrator’s instructions. This entry was posted in New Products, Recipes, Uncategorized and tagged recipe on June 15, 2015 by Homesteader's Supply. Social Media Options – Join Us! Hello? Hello? Anyone here? Can you hear the echo at Facebook? Oh my gosh, it is quiet there. It’s like walking into an empty room. If you stop in would you please give us a like, forward something (especially blog posts!) or somehow let us know we’re not alone? Facebook is allowing only 4% of our followers to see our posts. Social media should be social, right? Our newsletter is sent out every Wednesday. We share tips, recipes and other information you won’t find on our other social media outlets. The latest blogs are linked to in the right sidebar in case you missed them. We announce new products in the newsletter, answer questions and during the holidays, we shared family traditions sent by subscribers. It’s more than just a few links to blogs. We have great information in our newsletter. You’ll find us on Google+, though honestly, we aren’t active enough there. Now that winter is here we’ll spend more time developing our circles. We love Twitter! We’re always looking for new homesteaders, preppers and other like-minded people to follow on Twitter. And of course, we blog! Homesteader’s Supply Blog. We’re working on a series on homestead planning. If you’re planning to homestead or already homesteading and looking for more information you should be able to find useful information in the series. We share recipes, tips, details on new items, homestead happenings and more. We participate in [NeighborWoods] with other homesteaders on Tuesdays. Would you like to guest blog or reblog? Get in touch! And please leave a link to your blog in our comments. We want to visit your blog, comment and build community. 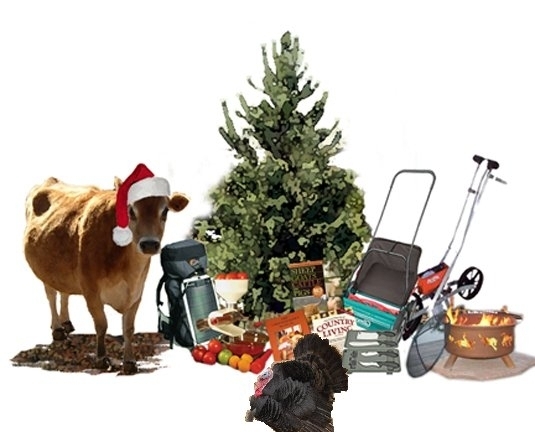 This entry was posted in Homestead Happenings, NeighborWoods, New Products and tagged social media on December 29, 2014 by Homesteader's Supply. Holiday Specials! Check back often for more items! 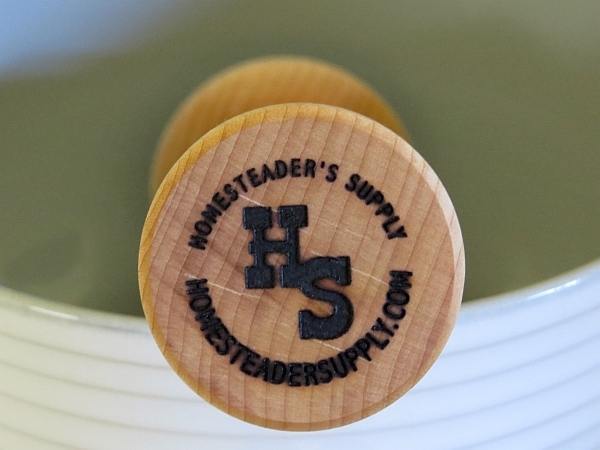 Holiday Specials at Homesteader’s Supply! Check back often for updates on our Holiday Specials. We’re starting off the holiday gift giving season with two sales. 1) Triple Wood Cutting Board and Rolling Pin – on sale through end of the year AND we have a special offer. You’ll receive a $20 Gift Certificate to keep for yourself or give to someone else when you purchase this set. 2) Ultimate Cheese Press in Hard Cherry wood … Limited Edition only 25 available, first come first serve. Now on sale until end of the year! There’s a recipe for Farmhouse Cheddar Cheese in the blog to help you get started. Have you seen the video staring Wardee from GNOWFGLINS? Wardee shows us how to use the Ultimate Cheese Press. You’ll feel a lot more confident after watching the video. Making hard cheese is surprisingly simple. This entry was posted in Cheese Making, Homesteading, New Products and tagged new products, sale on December 1, 2014 by Homesteader's Supply. Just in time for Cyber Monday sales! We’re blogging a little early this week to bring you our newest product. Yes! Another new product. It’s great to give as a gift or keep as a treat to yourself. Jerri has commissioned a limited edition run of 25 Ultimate Cheese Presses made in cherry hardwood. They are beautiful! It’s first come, first served and a few have already sold. The sale price is in effect now and it continues through the end of December, 2014 or until all 25 presses are sold. Our cheese press is made for home cheese makers, designed and manufactured by Jerri Bedell, the owner of Homesteader’s Supply right here in the USA! Made from a beautiful grained cherry hardwood with various shades of darker marbling. Each press is as unique as the wood its made from. Cherry darkens as it ages and becomes even more beautiful. This wood is sturdy, solid and long lasting. It’s treated with organic coconut oil and is stamped with our logo. Are you new to making cheese? We have a recipe for a very nice cheddar to help you get started. Farmhouse Cheddar. If you’d like to print the recipe you can find the pdf file there. Download it to your computer, send it to the printer, and pick it up on the way to the kitchen. This entry was posted in Cheese Making, New Products, Raw Milk, Recipes and tagged cheese press, new products on November 30, 2014 by Homesteader's Supply. Oh my gosh are these beautiful! 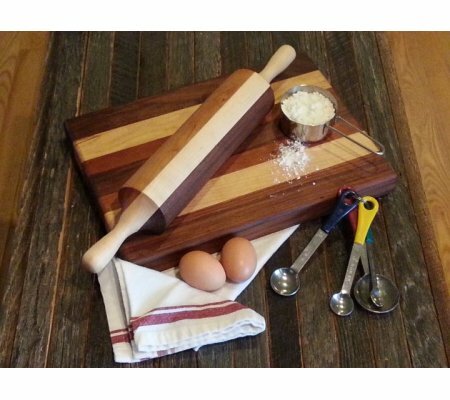 We love cutting boards and rolling pins and handcrafted, artisan quality wood products. We are very excited to have these ready for you to use during the holiday baking season and to give as gifts. They are fantastic! Jerri’s been busy. She designed our new handcrafted Triple Wood Rolling Pin and Cutting Board and she’s having them made in Tennessee. She’s created two more American designed and made products. The rolling pin is comfortable in your hand. They are made with maple, cherry and walnut hardwoods. No two are exactly alike because of the natural grain of each wood. Seasoned with 100% organic Non-GMO coconut oil which brings out the natural beauty of the wood. We chose coconut oil for its natural ability to inhibit bacterial growth without adding any coconut scent to your baked goods. 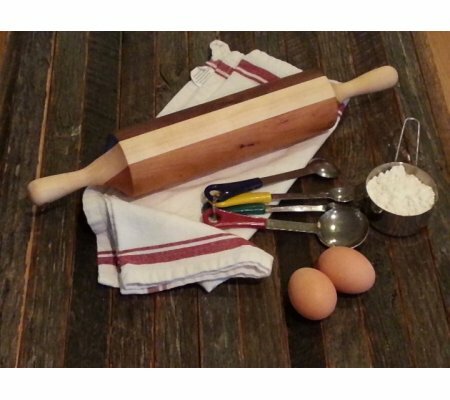 The Triple Wood Rolling Pin is 17″ long and 3″ wide. Its rolling surface is 9″ long. 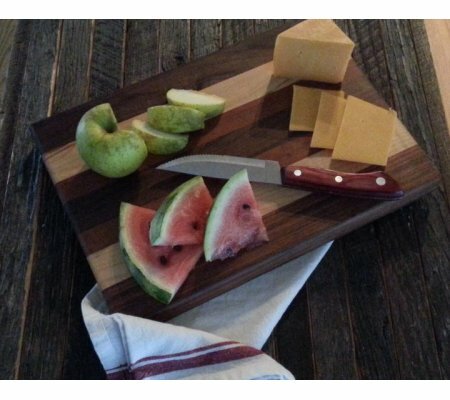 The Triple Wood Cutting Board is 14″ long by 10″ wide. It’s 1.5″ thick. It’s sturdy enough to handle any task. Slice bread, cut cheese and meat or even cut into those heavy winter squash using the cutting board. Both pieces are easy to care for. Wash only with warm lightly soapy water, air dry and reapply oil of your choice. All of our products add beauty to you kitchen as well as functionality. This set makes a great gift! You may purchase them separately or save money by ordering both pieces at a special price. This entry was posted in New Products and tagged kitchen tools, new products on November 17, 2014 by Homesteader's Supply. This morning I woke up with enthusiasm and dread. It’s a food day. Mushrooms needed to be cleaned and dehydrated. Beans were waiting to be picked, blanched and frozen. The blueberries were taken out of the freezer last night to thaw and needed to be made into jam today. I knew I’d be working with the Prepper Pro today. I waited until it arrived in the mail to make jam. When it was time to put it to use in the blueberries, I hesitated. 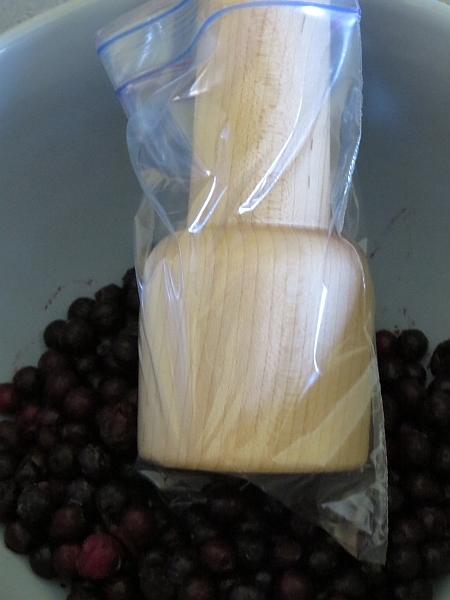 The Appalachian Maple wood is treated with raw, organic coconut oil but I wasn’t sure the blueberries wouldn’t stain it. It’s such a beautiful piece that I didn’t want to take chances with it. I thought about wrapping it in Saran wrap but wasn’t sure it would stand up to two quarts of blueberries without slipping. I opted instead for a zippered sandwich bag. It worked perfectly to protect the wood. A zippered sandwich bag protected the Prepper Pro from being stained. 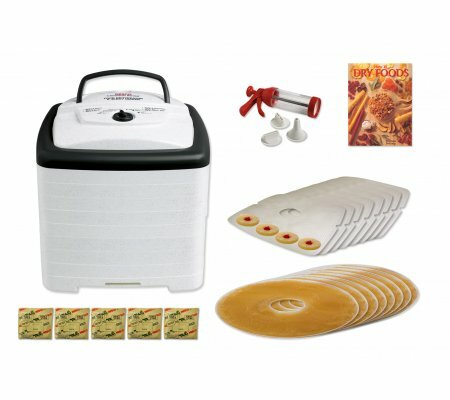 I won’t use the bag when I grind dehydrated Chanterelle mushrooms into powder or when grinding herbs. I’ll be pulverizing wild mint later this week. The large end (pictured above) of the Prepper Pro fits into a wide mouth canning jar. The smaller end fits into a small mouth jar. As I used it I thought of more ways I’ll use this new tool of mine. 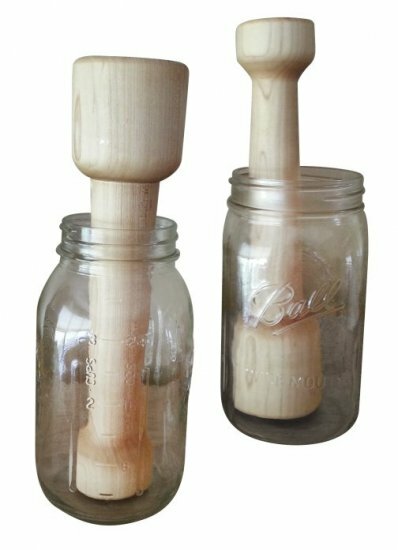 The Prepper Pro is another of our new products that was designed by Jerri, owner of Homesteader’s Supply, and is being made locally from locally sourced Appalachian maple trees. It’s well balanced, smooth as can be, and fits comfortably in my hands. Book: Fermenting Foods by Wardeh Harmon, just released this year 2012! The Prepper Pro fits into small and large mouth canning jars. I’ll be mashing strawberries, raspberries and blackberries I’ve frozen to use later. There are always herbs to grind, both fresh and dehydrated. And I think I’ll give a grind or two to my loose, dried tea blends to wake them up a bit before putting them into the tea ball. I’ll be using this for more than packing my jars when I make sauerkraut. I washed the Prepper Pro when I finished using it, applied more organic coconut oil, and put in easy reach on the shelf. This is going to be used often. And I’ll be adding the Prepper Pro to a few Christmas baskets this year. I have friends who’ll put it to good use! 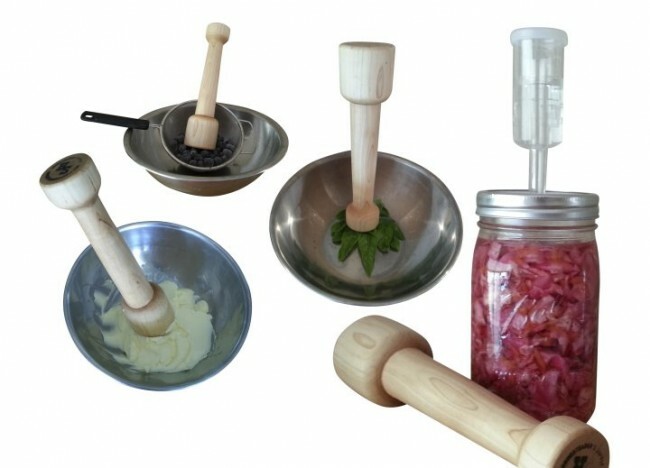 This entry was posted in Canning, Fermentation, New Products, Preserving and tagged equipment, fermenting, kitchen tools, preserves on August 26, 2014 by Homesteader's Supply.